K u k s is an unusual name of a village situated in East Bohemia. It has a special place in the history of Czech culture as an outstanding work of European art. In the 17th century, a remarkable nobleman built within two or three decades a complex which is still a sample of Baroque art at its best, attracting both experts and laymen, even though much has changed there over the centuries and many of its monuments have disappeared. It is said that gold was mined here once; the word kuks means „a share in mining“. The Kuks area was a part of the Hradiště estates. In 1664, Jan Špork, a general of the Austrian cavalry, bought the estates. In 1684, Count František Antonín Špork, the general´s elder son, became the owner of all Špork estates. At that time, Kuks was known only for its springs which were believed by local people to have medicinal properties. Špork had its waters tested in 1694 by professors at the Prague Medical Faculty. Their judgement was very favourable and so Špork set a very ambitious objective – to change Kuks into a world-famous spa. The construction started around 1695. Kuks became a highly popular health resort with all sorts of entertainments and a centre of social life that was magnificent. There were celebrations accompanied by music and cannon salvoes and Venetian nights on the Elbe River, great hunting expeditions, singular fairs at which the wells were filled with wine. For a short time, Špork´s court was crowded with artists such as engraver Michael Heinrich Rentz, architect Giovanni Battista Aliprandi, painter Petr Jan Brandl, poet Johann Christian Günther and one of the greatest Baroque sculptors, Matthias Bernard Braun (1684-1738). The left bank of the Elbe River (today’s village) used to be the spa resort itself. Chapel of Assumption of Virgin Mary was built there in 1696, followed by chateau in front of it in 1710. The chateau served as a natural center of the resort as well as a main spa house with colonnades. Guests were accommodated in the Golden Sun Inn, and a wooden theatre with Italian acting companies served their entertainment. Way to the river led via staircase lined with sculptures of Tritons and cascade channels where wine used to flow during festivals. Polyphemos, guarding the fountain under the staircase, used to contain a musical automaton. While the left bank of the Elbe served for representation purposes, the right bank was intended for leisure. Crossing the bridge lined with sculptures of Harlequins, guests could visit a horse racing track, decorated with sculptures of 40 dwarves (with faces of Count Špork’s enemies). Free time could also be spent in a natural maze, in a garden house with pool tables, or shooting birds at a dovecot. The rest of the right bank was intended for spiritual life and contemplation. Count Špork deposited his immense library into the Philosophers’ House, where it was freely accessible to all his guests. The building of the hospital dominated the right bank of the river. The hospital was built between 1707 and 1715 together with Holy Trinity Church and the crypt. The church was designed by an Italian architect G. B. Alliprandi. 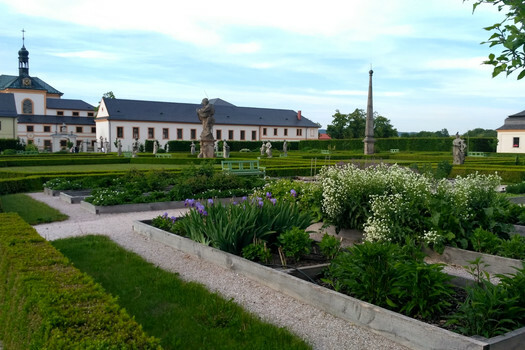 On the terrace, outside the church, allegories of the Faith and eight Beatifications were placed and, in front of the hospital wings, allegories of the Virtues and Vices by M. B. Braun were situated. Behind the hospital, there was a garden and, at the end of the whole complex, a cemetery was placed. Glory of the spa complex had been quite short-lived, surviving its founder only for two years. In 1740, the valley was almost completely destroyed by a massive flood, which took away many buildings and other installations. Špork’s descendants had neither the enthusiasm nor the money to rebuild the complex and what was once a widely known center of entertainment became a quiet village Kukus with mostly German population (expelled in 1945). The uninhabited Kuks chateau burnt down in 1896 and in 1901 its ruins were pulled down. The care of the hospital was handed over to the Spanish Order of Brothers Hospitallers of St. John of God (the Mercyful Brethern) in 1743, which continued the tradition of housing and nursing here a hundred old men, mostly ex-soldiers and war veterans, until 1938. During the Second World War, the hospital was turned into a correction house for young boys, and since the end of the war until 1972, it served as a rest home for the elderly. 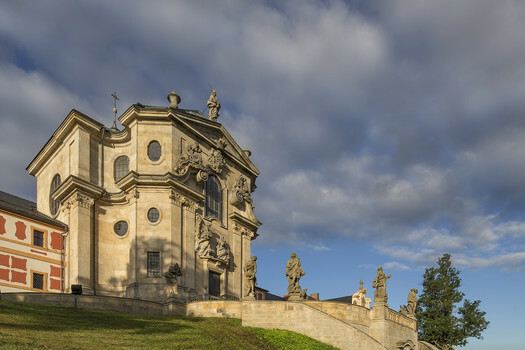 Since 1946, the building of hospital is used as a museum of Baroque art and Czech pharmacy. Currently owned by the state, the hospital was proclaimed the National Monument of the Czech Republic in 1995. The Kuks Hospital is now administered by the Institute for Preservation of Cultural Heritage (NPÚ).